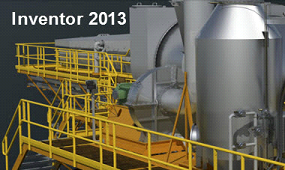 Our Inventor 2013 Training covers the fundamentals and more advanced topics found in the Inventor 2013 application. Our self-paced instructor led tutorials take you step-by-step through the course to help bring your knowledge and skills to the next level. This 2 disc training program consists of over 27 hours of tutorials and also includes the project files used by the instructor. This will allow you to open the files on your own software to recreate what your instructor has worked on. The experience and skills you obtain from our training tutorials will help you design, visualize, and simulate your products before they are even built. When you learn Inventor 2013, you will see how it can assist in designing your product more efficiently. Our training tutorials will help you learn the basics and the advanced topics of Inventor 2013, which helps your productivity as you learn to work more efficiently. Having the ability to automate repetitive design workflows helps reduce development costs and get your product to market faster.